FAQs have been grouped into eight categories. Click on a category below to view the related FAQs. Can a team use a project that they did for a science fair or another competition? Yes, if it meets the entry submission guidelines, and the Mission Folder is completed. What if a team misses the deadline for registration or if a Team Advisor needs to make a change to their team after the registration deadline? Any changes to registered teams must be completed before the deadline. If you have any questions about this deadline, please do not hesitate to contact Mission Control, missioncontrol@eCYBERMISSION.com. How many hours of work do you expect it will take for a team to complete the competition? There is no set answer to this question. To estimate, look at the time a student spends on other long-term projects and expect this to be the same. The Team Resources section on this site has tools to assist teams with time management and planning. Can I change my project during the competition? A team may change the focus of their project. Mission Folder submissions are due February 27, 2019. How much access to a computer is required? A lot! This is a web-based competition. All of the collaboration tools – Team Talk, CyberGuide Live Chats, and Discussion Forums - as well as information about the competition - registration, rules, the Mission Challenges and Mission Folder - are on the website. All entries must be uploaded through the website and teams are encouraged to use technology in researching their entries. Check out the Technical Information section for more details. What type of monitoring will there be of the Discussion Forums, Team Talk and CyberGuide Live Chats? CyberGuides and Mission Control will periodically review the Discussion Forums and Team Talk. eCYBERMISSION staff are always present during CyberGuide Live Chats. Will students' pictures or names appear anywhere on the site? Winning entries that are posted to the eCYBERMISSION website will have the team name and school/organization of the Team Advisor. Winners will be asked to sign a release for any use of names or pictures. Can students from different grades be on the same team? No, all team members must be in the same grade. Can a school have more than one team enter from each grade? Yes! There is no limit to how many eCYBERMISSION Teams a school can have. Is the eCYBERMISSION website a secure and protected website? Yes. The eCYBERMISSION website uses the Secure Sockets Layer (SSL) protocol. SSL uses a cryptographic system that uses two keys to encrypt data (a public key known to everyone and a private key known only to the recipient of the message). By convention, URLs that require an SSL connection start with https: instead of http:. All information entered onto the eCYBERMISSION website is protected and never shared with outside sources. A volunteer can serve in the following ways: Ambassador and CyberGuide or Ambassador and Virtual Judge. A CyberGuide may not serve as a Virtual Judge. Team Advisors may serve as Ambassadors but may not serve any other volunteer role in the competition year. How many Mission Folders would I need to judge as a Virtual Judge? This depends on the number of judges volunteering for the year and the number of Mission Folders submitted however an estimation based on years past is 15. Can a Team Advisor also serve as a Virtual Judge? Where will the CyberGuides be located? CyberGuides are located around the country and are only accessible via the Internet through scheduled bi-weekly CyberGuide Live Chats, Team Talk, and Discussion Forums. How quickly will CyberGuides respond to questions? CyberGuides will do their best to respond to Team Talk requests within 3 days of posting a question and are asked to check the forums weekly. If you have not received a response within a timely fashion, please contact the Volunteer Program at volunteerprogram@eCYBERMISSION.com. What sort of questions can CyberGuides answer? They can answer questions about the competition and direct teams to useful sources of information. They can also help your team choose a Mission Challenge! They cannot complete your research or Mission Folder for you. When will CyberGuides be online? CyberGuides are available to assist teams from the opening of registration until the Mission Folder submission deadline. Teams can pose questions to CyberGuides through the Discussion Forums, reach out to specific CyberGuides through Team Talk or participate in one of the bi-weekly CyberGuide Live Chats hosted by eCYBERMISSION between August and February. If my team builds something as part of the project, can we mail it in? No. All Mission Folders and attachments must be submitted via the Internet on this site. Consider a creative alternative to capture it, perhaps build the object through a computer simulation or build it and then use video or digital photography to capture the image and submit it. Will teams get to see other teams' entries? Teams will not be able to see work from other teams during the competition. However, winning entries will be posted on the site after the competition. Will teams get any feedback from the Virtual Judges or find out their score? Yes, Team Advisors will receive score ranges and comments from Virtual Judges on each submitted Mission Folder. Will the Virtual Judges know anything about the teams whose Mission Folders they are judging? Virtual Judges will only know the grade level of the team. How many Virtual Judges will review each project? Three Virtual Judges will review, score, and provide comments on each project. Does the team collaboration category favor teams from "high tech" schools and kids who have computers at home who can use them to collaborate more often? No. Team collaboration is not dependent upon Internet access or computer availability. Virtual Judges will look for evidence that the team worked together and effectively used a broad range of team member skills. Must students pay taxes on awards and prizes? Yes. All taxes on awards, if any, will be paid by the winners. For additional information please visit: treasurydirect.gov. When will winners be posted on the site? State Winners will be posted to the site in early May. National Winners will be posted in early July. What happens to the Mission Folder after a team submits it? The Mission Folder is randomly assigned to up to three Virtual Judges who will review the content of the Mission Folder, including any attachments or supporting web pages that are referenced. Virtual Judges enter a score for each of the three judging criteria, which combine for a total Mission Folder Score of up to 500 points. At the end of the Virtual Judging Period, the system tabulates the scores for each team and identifies for each state and grade – those with the highest overall score (First-Place State Winners), the second highest overall score (Second-Place State Winners). To qualify as a winning team, the Mission Folder must receive a composite score of at least 300 and be validated. All 3rd place teams with a composite score of at least 300 will receive an Honorable Mention Award. The top three scores in each grade in each region will advance to the Regional Judging event. The Regional Judging Panel will review and score these mission folders. The highest scoring team in each grade from each region will be named Regional Winner and will advance to the National Judging& Educational Event. Can a team submit more than one Mission Folder? As a community member, what can I do to support the competition? Be sure that the appropriate staff at your school is aware of the competition. You can become an Ambassador with the program to receive promotional materials and information to help publicize the competition. To find out more about being an Ambassador please visit Roles section. As a parent, how can I get my school involved? Be sure that the appropriate staff at your school is aware of the competition. Promote the competition with your kids! Get other parents involved. Be sure to check out the Parent's Guide to eCYBERMISSION on this site. Be sure to sign up as an Ambassador for support in promoting eCYBERMISSION. How much time is required of a Team Advisor? Team Advisors act as a facilitator and mentor for each team he/she sponsors. Since a Team Advisor has a limited number of required eCYBERMISSION roles, the time dedicated to eCYBERMISSION may be as little as 8-10 hours per month. However, it is up to the Team Advisor and his/her team to decide how much he/she will participate. What if a Team Advisor needs to drop out? The team will need to find another Team Advisor. The current Team Advisor should email Mission Control to notify eCYBERMISSION of the change. Mission Control will provide further instructions to the Team Advisor. Who can be a Team Advisor? Parents, school advinistrators, community leaders can all be Team Advisors so long as they meet the eligibility requirements. How is a Team Advisor responsible for his or her team? Team Advisors are responsible for the behavior and ethical conduct of their students, both inside and outside of the classroom. This includes, but is not limited to, postings in Discussion Forums, CyberGuide Live Chats, Team Talk, as well as in experiments conducted by the team. Which technologies can I use to access the eCYBERMISSION website? eCYBERMISSION is a web-based competition so our website can be accessed with a variety of devices as long as that device (laptop, tablet, etc.) has a web browser. We do not recommend accessing the site with a smart phone. Users should be able to access eCYBERMISSION with a standard iPad or Mac. If you have a concern about compatibility, please contact Mission Control for technical assistance. I am trying to upload a file to my Mission Folder but I keep getting an error. Why is that? 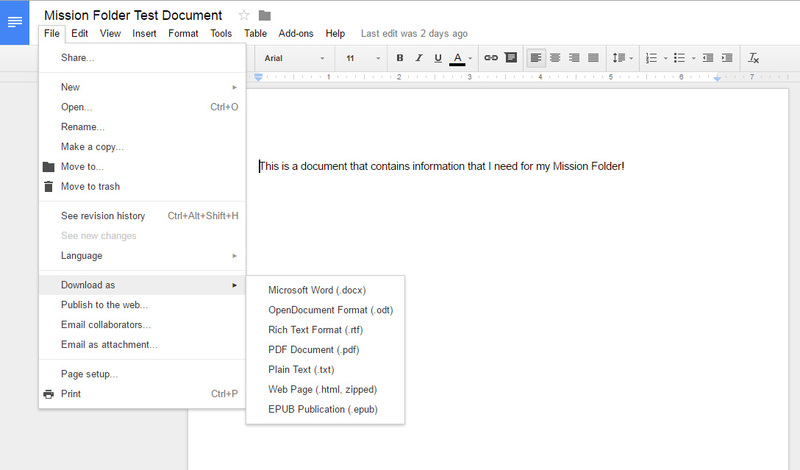 Can I upload Google documents directly to my Mission Folder? No. To upload a file that is currently a Google document, you will need to download it as type of file that is compatible (see answer above). You can do this by clicking on the "File" button and then "Download as" (see below). Then, just choose the type of file you’d like to use. We recommend .pdf for text documents, PowerPoint (.ppt) for presentations, and Excel (.xls) for spreadsheets. What if I’m using Google documents on a tablet or a Chromebook? How do I convert my file to a compatible type? If you are using a tablet, you will not be able to convert the file using the method above. Instead you have two options: Your first option is to download all of the Google apps that are used with the different types of Google documents (Sheets, Docs, and Slides). Within these apps, you will be able to save your Google document files as compatible files. Your other option is to access your Google drive from a desktop or laptop computer that has a hard drive and then convert the file. What are the possible awards? eCYBERMISSION awards participants at the state, regional and national levels. Each state* will be awarded one First-Place Winning Team and one Second-Place Winning Team, per grade, provided the team gets a minimum Mission Folder score of 300. Of the First-Place State Winning Teams, one team per grade and per region will be awarded a First-Place Regional Award and a chance to compete for the National Award at the National Judging & Educational Event (NJ&EE). At NJ&EE, each of the 20 First-Place Regional Winning Teams will compete for the National Award in each grade. The third place teams in each grade, in each state, will receive honorable mention. What do the winning teams receive? Each student on the First-Place State Winning Team will receive up to $1,000 in U.S. EE Savings Bonds (matured value). Students on Second-Place State Winning Teams will receive up to $500 in U.S. EE Savings Bonds (matured value). Each team that is selected as a Regional Finalist will receive up to $1,000 in U.S. EE Savings Bonds (matured value) per student. Each Regional First-Place Winning Team will additionally receive up to $2,000 in U.S. EE Savings Bonds (matured value) and a trip to compete at NJ&EE in the Washington Metropolitan Area. National First-Place Winners receive an additional up to $5,000 in U.S. EE Savings Bonds (matured value). All savings bond values are at maturity value. Will there be any contact between Army personnel and the students? Civilian and uniformed Army personnel serve as CyberGuides, online experts who will communicate over the web, and Ambassadors who visit schools to promote the competition. Army volunteers participate as State, Regional and National judges. Army personnel actively participate in the National Judging& Educational Event, with NCO’s and Scientists & Engineers acting as mentors. How does the Army benefit from this? The Army is indebted to our American communities for their support. This is one way the Army can give back to America, by helping youth learn more about the areas of Science, Technology, Engineering and Mathematics.